Which Juvederm Filler Do You Need? - Doctor Hermann M.D.,P.A. Getting older has its benefits and drawbacks, but is the extra wisdom really worth the extra wrinkles? Thanks to dermal fillers like Juvederm, you no longer have to pick between the two! 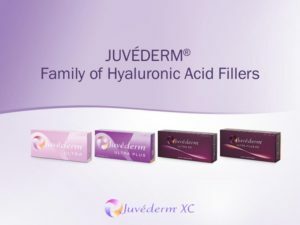 Juvederm is one of the most widely used family of dermal fillers because its hyaluronic acid formula can subtly and efficiently resolve such a wide range of age-related skin imperfections. So which variation of Juvederm do you need to feel like the best version of yourself? Juvederm Volbella is FDA-approved specifically for lip augmentation. It naturally and subtly enhances your pout so that your lips are noticeable without looking obviously “worked on.” Volbella is formulated with a unique blend of low and high molecular weight hyaluronic acid molecules. This not only helps the hyaluronic acid blend nicely within the skin, but it also ensures that Volbella is more durable and maintains results longer than other similar fillers. Juvederm Voluma is proven to add volume that corrects age-related volume loss in the cheeks. Smooth hyaluronic gel is injected strategically into the apex, apple, and hollow of your cheeks. The injections work immediately to boost your skin with the volume it was previously lacking. Within minutes, your cheeks become fuller and you can enjoy a younger and more vibrant appearance. These incredible results can last up to two entire years before a new injection is needed! Juvederm Vollure is the first and only hyaluronic acid filler using Vycross technology to be FDA approved for the correction of moderate to severe facial wrinkles and folds for up to 18 months. Vollure can be used to treat bothersome nasolabial folds and marionette lines that form as a result of age and sun exposure. Juvederm’s special Vycross technology is used to create a more connected gel that can be subtly molded to lift the sunken skin that causes wrinkles and lines. Who ever said your skin had to show its age? You don’t have to look far for the right professional to sculpt and enhance your appearance with Juvederm. Dr. Hermann of Hermann Wellness has been serving patients throughout Tampa and St. Petersburg for many years. Dr. Hermann is a dermal filler expert who will evaluate your skin and recommend the best dermal fillers to help you achieve the look you want. Call (813) 902-9559 now to schedule your first appointment!